Manitoba and Saskatchewan have an abundance of energy, be it Hydro Dams, Gas/Coal Fired Power Stations, Oil and Gas Wells, or Windmills. The access to these sources make this area an attractive location for a multitude of economic activity. 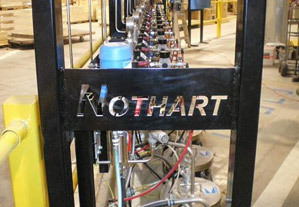 Nothart is active and happy to contribute our share in providing distribution for equipment required in this sector. We spec and sell Howden fans, pre -heaters, Flo Corp Level sensing equipment, Paul Mueller Heat Exchangers, High Pressure Pump Stations, progressive Cavity pumps for Oil/Gas transmission, and Fire pumps to name a few. If you need your Hydro/Gas/Oil to go a little further, please contact us to see if we can save you some energy money by recommending a Variable Frequency Drive for your current or upcoming rotating assembly motor.